Dearcroft Montessori School’s mission is to provide our students with the opportunity to develop and nurture their individual academic and social strengths in a safe and motivational learning environment. Within classically structured and fully equipped Montessori classrooms, immersed in a naturally inspired setting, our students experience an exciting, well balanced curriculum. Individually, we strive to nurture character and independence through helping all of our students acquire the tools needed to pursue a lifelong love for learning. 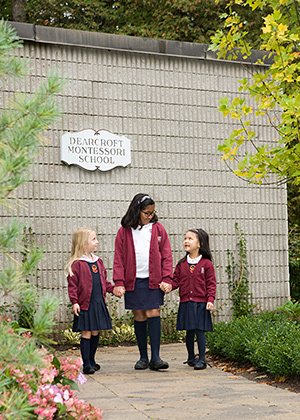 Established in 1968, Dearcroft is Oakville’s original Montessori school and the first in our community to offer a comprehensive Junior High (Grade 7/8) program since 1999. Now approaching our 50th Anniversary, we offer a full toddler (18 months) to Grade 8 program. Dearcroft is a fully accredited charter member of CCMA (Canadian Council of Montessori Administrators) and O.I.S. (Oakville Independent Schools).